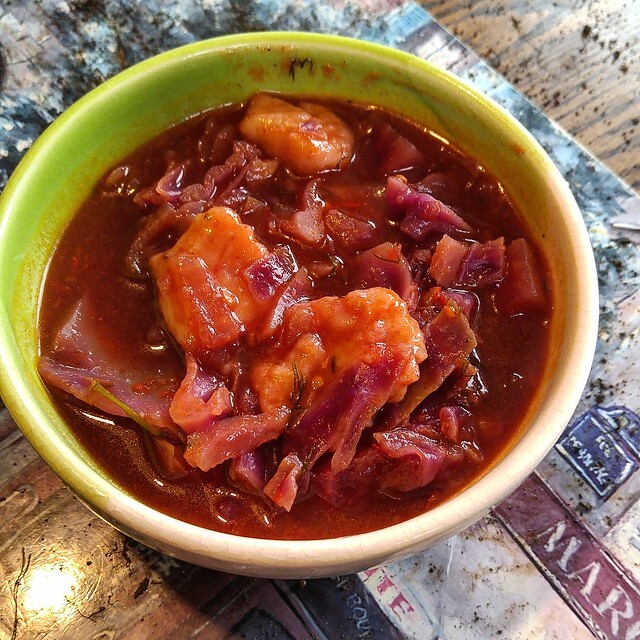 Russian Cabbage Borscht | What Smells So Good? While it's been unseasonably warm here lately, every time I turn to the news the meteorologist unfailingly manages to drop the "winter is coming" bomb. Truth be told, I've already broken into my box of Hot Packs for recesses outside, and a scarf is a more or less permanent article of clothing once again. After a long day at work, both inside and out, there's nothing I crave more than a bowl of hearty, healthy comfort food, and thanks to my late-season harvest of Lutz beets, carrots and herbs I knew exactly what I would be making. Mom loves borscht almost as much as I love shredded raw beets (which is, to say, a lot) and there was no better way to "soup up" our week's worth of lunches than to whip up a batch. I started with a Russian recipe from one of our "international" cookbooks that not only used the traditional beets, but shredded red cabbage, tomatoes, onions, celery and carrots too. The recipe originally called for the veggies to caramelize in bacon fat and oil, but nestled in the back of my fridge was a jar of home-rendered schmaltz - culinary gold for old world recipes like this one! I slowly sauteed the onions in the chicken fat until they were nice and golden, adding the spices so they could cook out alongside. Everything else soon followed, filling the pot with savoury-sweet goodness. The final step called for adding potato dumplings for extra heft, but with the hour getting late I opted instead to raid my freezer and toss in a few handfuls of my Always Fluffy Gnocchi instead. They soaked up the broth equally well, plumping into pillows of delicious starch and turning the spartan soup into a hearty lunch. Paired with a chunk of homemade bread (our current loaf is a rendition of this Lager and Rye Bread), a bowl was perfect to come into the kitchen for. The best part? Like almost every other soup on the planet, this just gets better and better. It even freezes well! Heat schmaltz or oil in a large pot over medium heat. Stir in onions, caraway seed, paprika and salt. Cook, stirring occasionally, until onions become golden, about 30 minutes. Stir in celery, carrot, and cabbage and cook 2 minutes. Add stock, tomatoes, beets, pepper, dill, thyme, vinegar and honey and cook, covered, 20 minutes. Add gnocchi, cover, and simmer on medium low heat at least 30 minutes. This gets better with age!